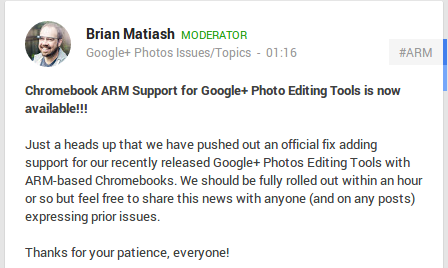 If you own the new HP Chromebook 11, or any other laptop running Chrome OS with an ARM processor, you’ll be pleased to hear that you can now access the latest photo editing tools available on Google+. Brian Matiash, a community manager for Google+ Photos, announced the additional support over on Google’s photo-friendly social network. GooglePlusDaily spotted the post, but at the time of writing it appears to have been taken down, or at least made unavailable to the public. Regardless, it means that a wider number of Google+ users can now use the new Snapseed-powered photo editing features introduced in September. Just find the photo and hit the ‘Edit’ tab at the top of the page; from here, you’ll be able to make adjustments to the brightness, contrast, saturation and sharpness, as well as apply analog-inspired filters.